Product descriptions have a huge impact on your sales and on the overall user experience. Studies show that around 20% of failed purchases are related to missing or unclear product information. Most people just focus on good quality images, which is also important, but customers want to know as much as possible about a product before they buy it. 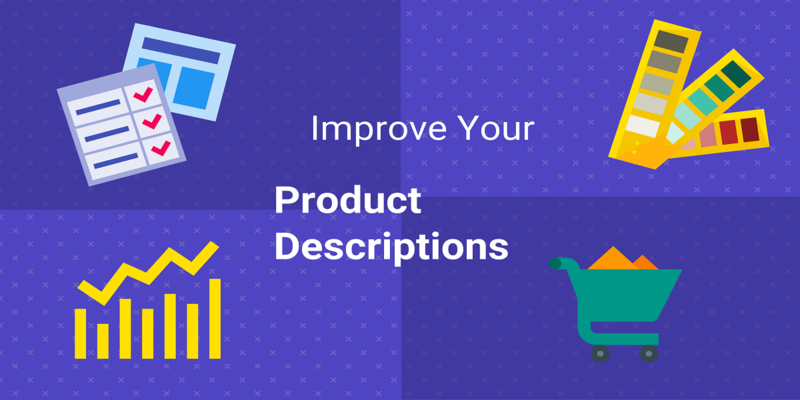 There are several ways to improve your product descriptions and we’ll present you with practical tips on how you can do that. The first step to writing a good product description is to define your target audience. You need to understand your potential buyers and create a list of their characteristics, interests and benefits they might be looking for. Don’t limit yourself to the most obvious reasons why they would want to buy your products. Look beyond that and add a general context to it, buyer’s lifestyle, major interests and desires. Consider their location, age, gender, education and income level. This brainstorming session to find out more about your audience will help you a lot in the way you present your products and most importantly, in the way the customers react to them. People don’t spend too much time reading a lot of technical details about a product, they want to know how it can improve their lives or solve their problems. This is what you need to focus on. Your product descriptions have to have a clear list of features and unique specifications that would help the shopper take a decision. Create a list of features for your product and see how you can translate them into direct improvements or benefits for your customers. Power words are meant to grab attention and inspire emotion in your reader. These influential words improve the persuasiveness of your descriptions. You can read more about power words and how to use them here. Your product description has to be easy to read. People have a short attention span and statistically, they read only about 16% of what’s on the page, so you need to make it easy for them to see the benefits of your products. The most important features must stand out from the rest of the section. Consider using a separate bullet point list for these so the users can easily see them. Short individual paragraphs could work too if you need to say more about your products. Don’t be afraid to use white space or different font sizes. Optimizing your content for search engines is really beneficial for your store. Include keywords in the product titles, descriptions, meta descriptions and image tags. Create a nice balance between keywords and power words to raise your customers’ interests and curiosity. You can use LSIGraph to generate a list of keywords you could use. Your product description should present the key benefits of your items, the description should be short, but powerful and persuasive. Consider adding more information about the products in a special section such as More Details or Additional Information. Use a language your audience understands and don’t get too technical about it. Focus on the customers, not on your company or the product. Feel free to add information provided by your other clients to help the potential ones decide to buy your products. ⦿ What problem does your product solve? ⦿ What power words reflect the benefits of your product? ⦿ Would you recommend the product to a friend? What would you tell them about it? ⦿ Does your description include popular keywords?